Open Plan Furniture never looked so good! These sleek and stylish modern workstations feature rustic woodgrain panels and worksurfaces combined with architectural metal legs along with acoustic felt dividers to blend form and function for today’s modern workspaces. Also featured are our unique flared worksurfaces that provide more usable desktop space in a compact workstation footprint. 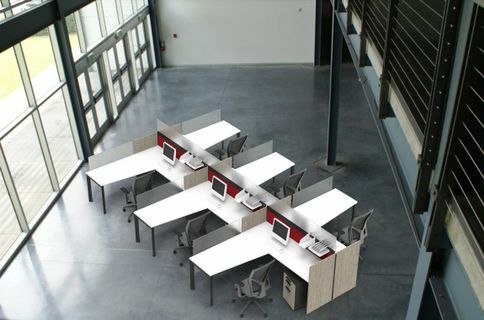 Add this open office workstation design to your Quote Request and we’ll provide a budget estimate and work with you on a test-fit layout for your space.